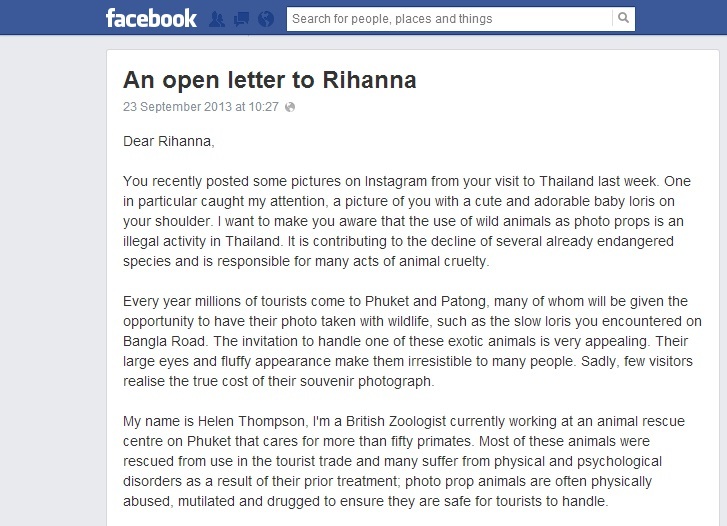 PHUKET: A letter to Rihanna written by a volunteer at the Gibbon Rehabilitation Project, pleading for the superstar singer to raise awareness about the plight of the loris has gone viral on the internet. 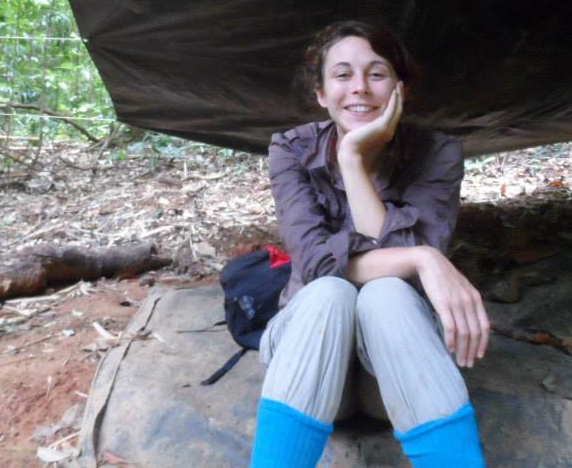 Helen Thompson, a British zoologist and long term volunteer at the Gibbon rescue centre, first published the public “letter” via her Facebook page last week, after Rihanna photographed herself with an endangered slow loris on Bangla Rd while on holiday in Phuket. The letter, addressed “Dear Rihanna,” outlines the issues surrounding the loris trade on Phuket, including the inhumane treatment they often receive and the fact they often have their teeth cut out or trimmed to prevent them from biting tourists. “Please help us raise awareness about this problem by speaking out against it and asking your fans not to have their photo taken with exotic animals when abroad,” Ms Thompson wrote in the letter. There has been no response from Rihanna or her PR team. Ms Thompson told The Phuket News today she knew the Facebook posting was “a long shot”, however, she thinks there’s a “reasonable chance Rihanna, or at least someone close to her, has or will see it”. “I sent a copy to Rihanna and her record company every way I could find, for example, through their websites, Facebook and Twitter. “The letter has also been shared and liked several hundred times via Facebook and Twitter. A drop in the ocean that may be, but it only takes the right person to see it and think, ‘Yes, this is good PR for Rihanna’, and something will happen. Ms Thompson said she wrote the letter because she believes it is possible to bring the animal photo trade to an end, “but to do so we need to get the right information through to the right people”. “Someone like Rihanna has the power to reach millions of people from almost every walk of life. “If she did openly come out and criticise the trade it would put this issue out into the mainstream media and get the attention of many people who otherwise might not give these kinds of issues a second thought. “Working at the Gibbon Project, I’ve spoken to so many tourists who are horrified to learn the truth about the trade but who sadly already had their photo taken with an animal because they simply didn’t know any better. “I’m not naive, I know it’s a long shot, but if it helps to raise peoples awareness of this problem, even just a little, then at least it will have done something. “As they say, an opportunity missed is an opportunity lost,” she told The Phuket News.